At The Spine Care Center in Manassas, our mission is to help our patients resolve their pain and get back to living their lives. We know that degenerative spine disease is both painful and life-disrupting, and we’ve helped hundreds of people just like you successfully treat their symptoms. 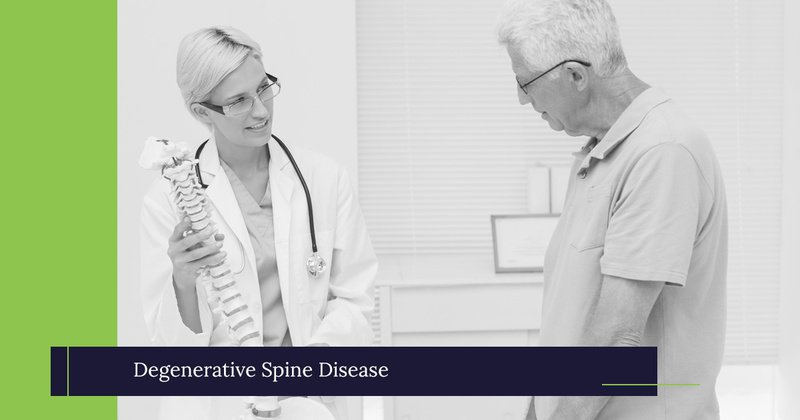 Learn more about the causes, symptoms, and treatment options for this condition below, and don’t hesitate to get in touch with our office if you would like to be evaluated for degenerative spine disease. The spine naturally becomes weaker with age, and for many people, this weakening causes a number of painful symptoms. It is often diagnosed alongside other age-related conditions. Concomitant diagnoses may include degenerative disc disease, in which the discs between your spine bones (vertebrae) become weaker and thinner over time. Degenerative joint disease, which affects the cartilage and bones, is another common condition that is often diagnosed in patients with degenerative spine disease. Though degenerative spine disease is a natural result of years of standing, lifting, sitting, and stretching, that doesn’t mean you have to live with the pain. Certain treatments can reduce the symptoms associated with degenerative spine and improve your quality of life. Though degenerative spine disease cannot be reversed, the right treatments can slow it down and relieve your symptoms. During your initial appointment, your doctor will ask you a variety of questions about your back pain to obtain a better understanding of your symptoms. They will also ask about any other symptoms you have experienced. Your doctor will also order imaging tests like X-rays or an MRI. These tests allow your doctor to see the bones, cartilage, and discs in your back and check for damage that may be causing your symptoms. The back pain experts at The Spine Care Center treat a wide variety of spine conditions, including degenerative spine disease. Our physicians use a patient-centered approach to your care, ensuring you receive treatment that addresses your condition and fits your lifestyle. Their experience and dedication to quality care have earned them repeated recognition as Top Doctors in both Washingtonian and Northern Virginia Magazine. More than 90 percent of our patients experience long-term pain relief without surgery. However, if your back pain continues, you will meet with our highly skilled spine surgeon, Faisal Siddiqui, MD. Dr. Siddiqui will assess your condition in order to ensure that surgery is a safe, effective choice for you. His careful approach to spine surgery and experience with the latest minimally invasive techniques helps ensure better outcomes, faster recoveries, and greater pain relief for his patients. Improve your spine health and your overall quality of life. Call The Spine Care Center or request an appointment online to get started.